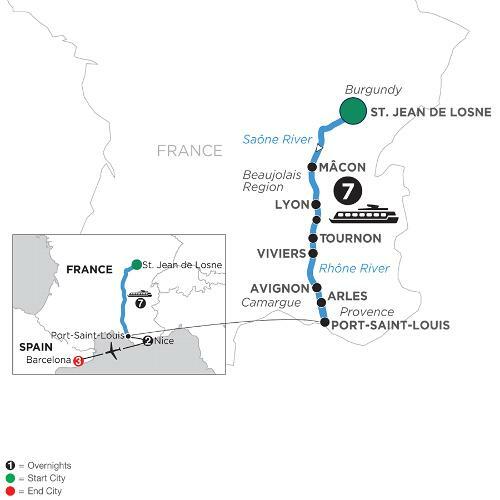 Take a wondrous river cruise through France along the Rhône and Saône Rivers, and complete your European vacation with a bonus Monograms vacation package in beautiful Nice and Barcelona. Embark your Suite Ship in St. Jean de Losne and sail to Lyon, a showcase of medieval and Renaissance architecture. Beautifully nestled among vineyards, you’ll find the twin cities of Tournon and Tain l’Hermitage. Enjoy a guided walk of Tournon, a medieval treasure with plenty of Roman ruins. Continue your river cruise to historical Avignon and see the 14th-century Palace of the Popes. On the Rhône River sits Arles—famous for inspiring the paintings of Van Gogh and its 1st-century Roman Amphitheatre. Fly from Nice to Barcelona, where you’ll enjoy guided sightseeing, including Passeig de Gràcia, La Pedrera, and inside visits Gaudi’s Casa Batlló, and Sagrada Familia Basilica, and relaxing free time—all part of your Monograms vacation package in Spain. At your service is an expert Monograms Local Host® who is available to you throughout your stay in Nice and Barcelona.